EDIT: I take some of my ire back, Gearbox. A message during the loading screen makes a reference to this feature. It should still be in the manual/part of the tutorial. Previous content follows. I must be going crazy. This game has been out a week and I still can't find anything online documenting this feature. For a game that's pretty much built around the mechanic of endless inventory shuffling, you'd think they'd want to make a big deal out of streamlining that experience. Hover over the right hand side of a gun's portrait to bring up the star/x buttons. Click to toggle the highlighted option on or off. Mark all the guns you want to sell with an X. Go to any store and hit Delete. Anything in your inventory marked with an X gets sold. Weep quietly in amazement. 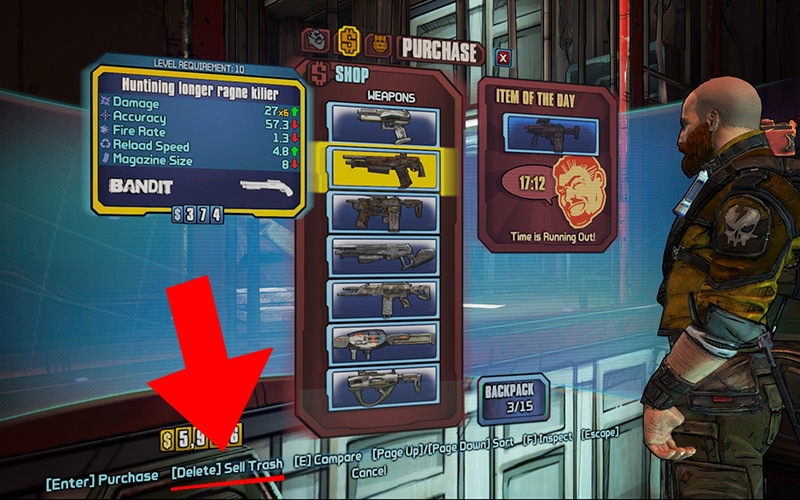 Now all those guns you're just carrying around until you find a store to dump them can be deleted in one button press! You don't even have to click over to the sell tab. Are you weeping with joy yet? Here's a question: Why is this not in the manual? There is an entire section dedicated to "Managing Your Stuff" and all it does is parrot the instructions that are at the bottom of the backpack interface. 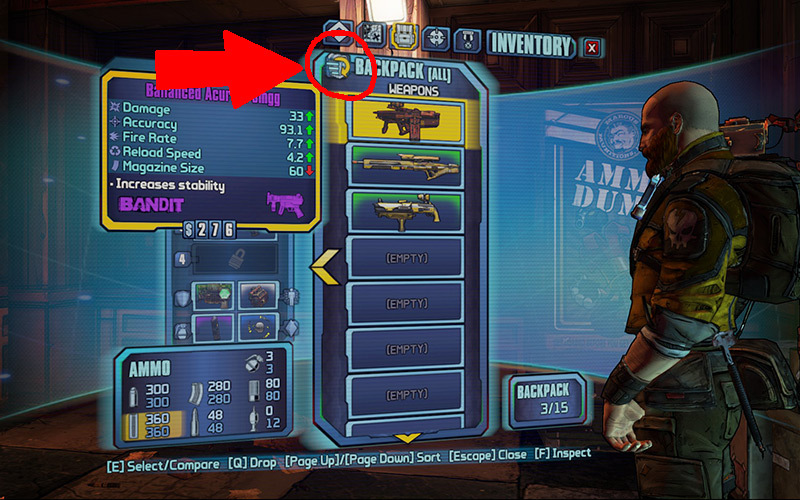 Click the icon to the left of the backpack to change the sorting criteria. You can sort by weapon type, weapon brand (which is basically effect type) - there's even a category for all your non-weapon items (not that you ever have many of those). I think if these two features (the first one in particular) were explicitly mentioned as part of the tutorial, the game as a whole (but especially the early game, where you're changing weapons much more often, and selling lots of similarly rubbish weapons) are more straightforward experience. This is paramount when you're putting co-op on a pedestal; the last thing you want to be doing when you're playing with your friends is making sure you're selling the right guns. It took me eight hours of gameplay to start to figure these things out; I can't imagine how many people never notice it at all. I'm assuming a similar feature exists on Xbox, but unless it's much more obvious, how would you even discover it? I only found this by accident when I was waving my mouse around.